In this non-conventional romance, Tara Sue Me (writing as Cat Waters) enthralls her readers in her latest novel which is aptly titled Obscured, as she takes them down a tale of where secrets, passions, hate and secrets are obscured and blurred. 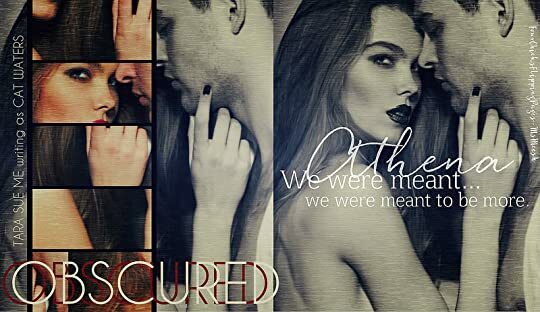 A tale where the truth is hard to perceive.Obscured is not your standard romance and takes more of the undertones of suspense and intrigue.As readers are invested into the story, Tara Sue Me bewitches her readers as they are taken on a whirlwind as they must decide where does the truth begin and end. At the age of 16, Athena is left to fend for her own when her mother passed away and her grief-stricken father disappears. As she makes her way to Las Vegas to take a shot at being a dancer, she finds out why Las Vegas is called Sin City. When Athena meets Mike, she was easily charmed by his personality and his caring nature. But little did she know, Mike will destroy her emotionally and physically as he makes him his whore. Forced into prostitution, the once little innocent country girl is now a call girl to one of the most feared men in Las Vegas. Ten years has passed and Athena is still a prostitute. With little money and education, Athena craves a new life especially how Mike treats her like a dog that needs to obey on command. So when she runs into her former childhood friend, Isaiah, who happens to be a pastor, Athena yearns for his kindness and affection. She sees Isaiah as possibly the only man who has treated her as a human being. When Athena finally decided to escape from Mike and gets help from Isaiah, will this be her chance for a new life? Or will she realize that things are not always how you perceive? Will Athena's rush decision for freedom be obscured with the realization that the least person she expected to help her might be the one to save her? "Because you are many, many things, but broken isn't one of them." Obscured is definitely a book that is more of a suspense thriller than romance. If you are expecting hearts and flowers and then I am sad to inform you this book is not your typical standard romance. There is no perfect hero or heroine in this book. Everyone is flawed and a bit mysterious which in tale helps readers to get bewitched as truths begins to get unfolded. I did enjoy the surprising twist of events that Tara Sue Me laid out throughout the book. Overall, if you are looking for a book that reminds us all that appearances can be deceptive then I recommend you give Obscured a try.